The Antiquarians are featuring an elegant and elaborately decorated Pre-Nippon Antique Japanese Porcelain Covered Jar Hat Pin Holder With Moriage And Enamel Work that is much older than it looks, and may even date back before 1898. 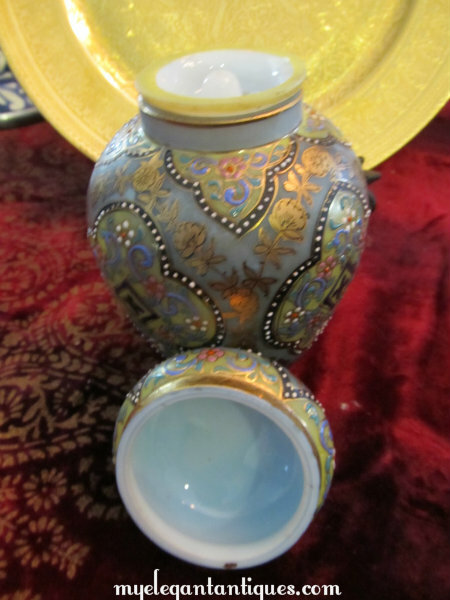 Made from exquisitely translucent porcelain (see our photographs), this unmarked Pre-Nippon Antique Japanese Porcelain Covered Jar Hat Pin Holder With Moriage And Enamel Work stands 5-6/8" tall with the lid, and rests on a base that is 1-7/8" in diameter. Painted with a background of matte cerulean blue, this jar was then decorated with black designs at the rim, the midsection and the base that each repeat four times around the circumference of the jar. The black designs were then outlined in gold and adorned with white beading. 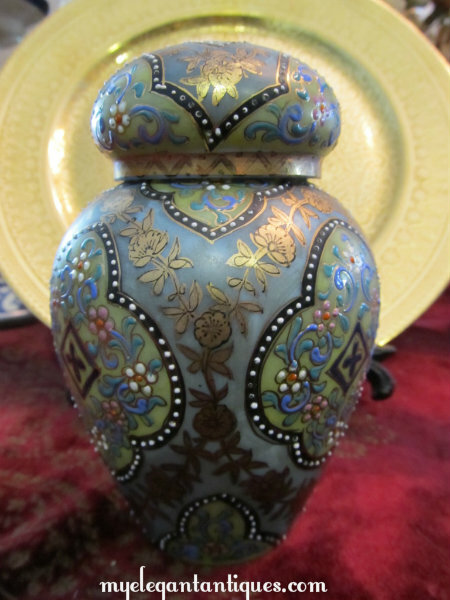 In between the exterior of the black designs, elaborate gold floral transfers were applied, but the true artistry lies within the black designs: a beautiful enameled moriage pattern using blue, green, white, pink, sage, orange, gold and black enamels transmutes this jar from the ordinary to the sublime! 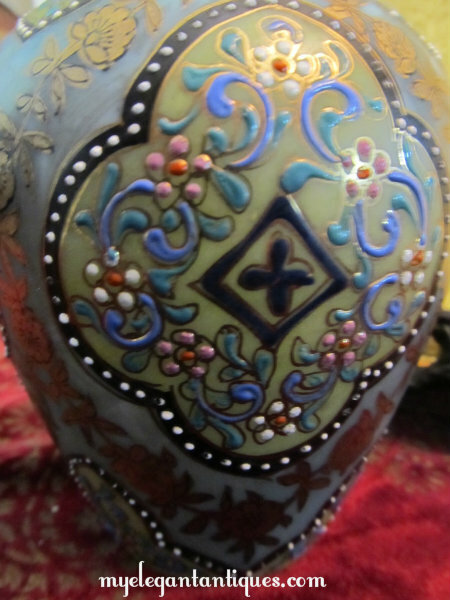 The same elaborate pattern on the body of the Pre-Nippon Antique Japanese Porcelain Covered Jar Hat Pin Holder With Moriage And Enamel Work is repeated in perfect detail on the lid. "So," - we hear you thinking - "it's a nice jar." "Oh no, it's not just a nice jar, it's not even a sublime jar, it is an ordinary household, utilitarian item elevated to fine art!" we reply. 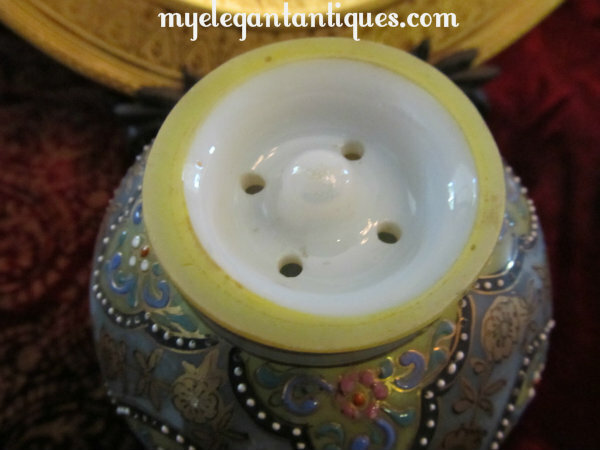 If you examine our photographs you will see that the Pre-Nippon Antique Japanese Porcelain Covered Jar Hat Pin Holder With Moriage And Enamel Work has an insert at the top with four holes in the insert spaced at regular intervals. 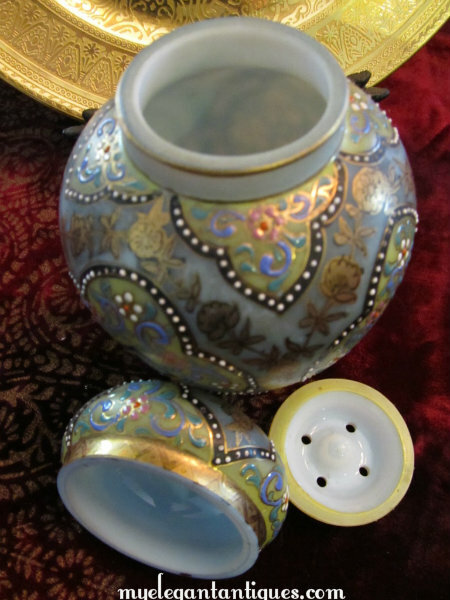 The insert is made with the same translucent porcelain as the jar and is bordered with a light gold band. 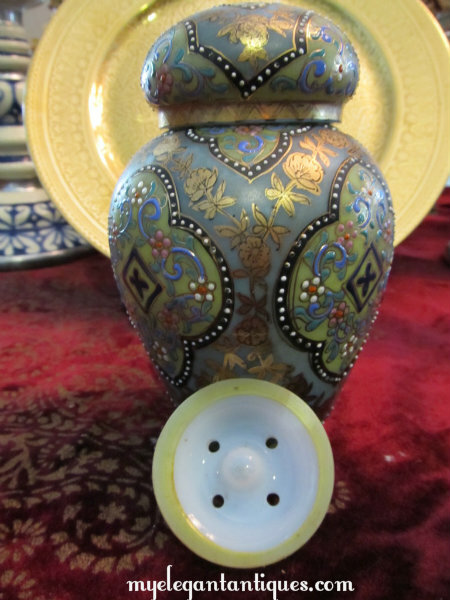 Dear viewers, we are looking at a hat pin holder that is easily disguised as a lovely jar if the lid is set in place. A hat pin holder! 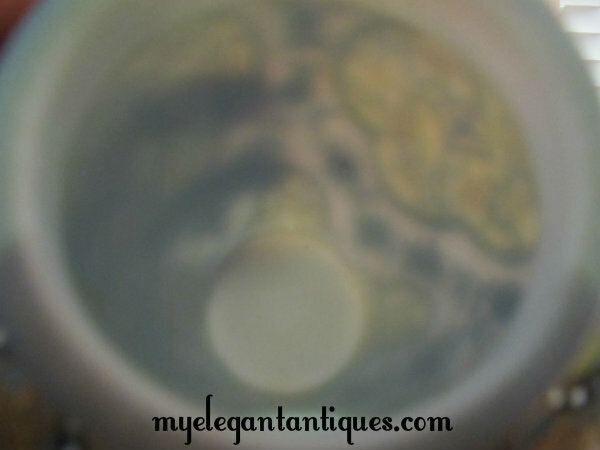 Please examine our photographs closely and admire the intricate work that went into this Pre-Nippon Antique Japanese Porcelain Covered Jar Hat Pin Holder With Moriage And Enamel Work: Note the translucency of the antique Japanese porcelain in the photographs. This hat pin holder is in amazing condition given its likely age. 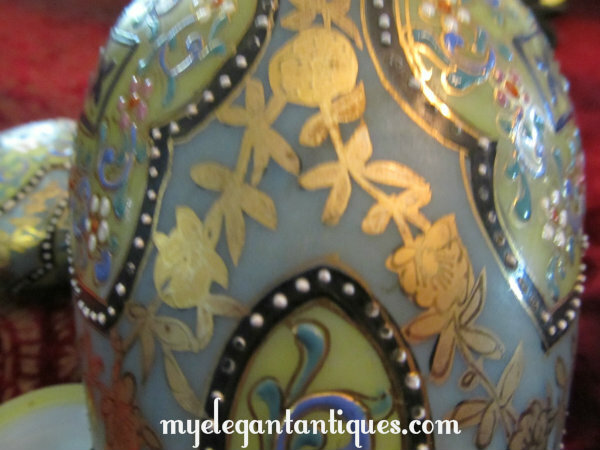 It has no chips, nicks or cracks; the gold transfer pattern is in beautiful shape, as is the enamel work. 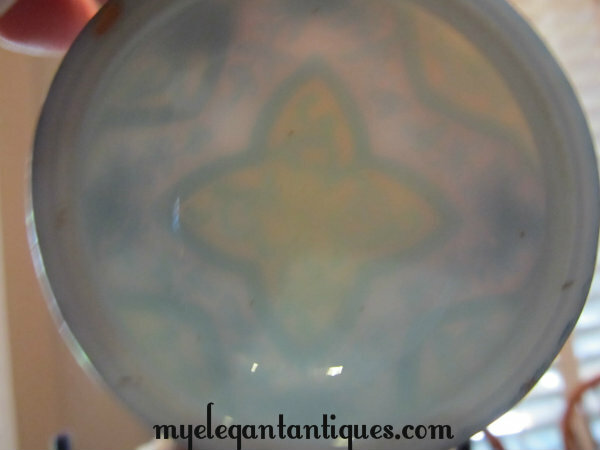 Some of the white beading has popped off or eroded, but this does not detract from the sheer beauty of this wonderful antique Japanese porcelain piece. This Pre-Nippon Antique Japanese Porcelain Covered Jar Hat Pin Holder With Moriage And Enamel Work is truly a treasure from the past! 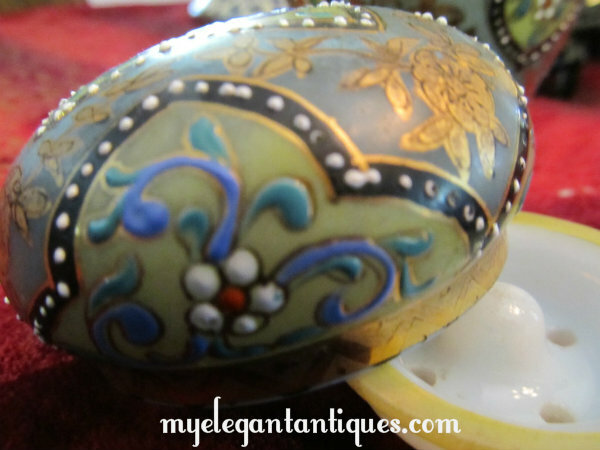 See this exquisite piece on our Facebook page and 'Like' us while you are there!